A friend of mine started a group on Facebook for her friends that wanted to participate in a 30-day ab challenge… apparently I’m a glutton for punishment because I said I wanted in. Each day the number of sit-ups, crunches, leg rasies, and the length of the plank increases with a rest day on every fourth day. I started the challenge on August 1 for the sake of simplicity, so I should be on Day 15 today, but I missed a couple days so I am actually on Day 14: 65 sit-ups, 85 crunches, 42 leg raises, and a 55 second plank. I didn’t do any before photos or anything and honestly I don’t see much of a difference–but I do feel it! I’m still a bit sore after each day, but the sit-ups are a bit easier to get through each day, as are the other exercises. After Day 1 (15 sit-ups, 5 crunches, 5 leg lifts, 10 second plank) I wasn’t sure I’d be able to make it this far, yet here I am. Doing 65 sit-ups. Yeah, I spread them out over the day sometimes, but I’m still doing them. And I know that even though I can’t imagine doing 125 sit-ups, 200 crunches, 65 leg lifts, and a 120 second (2 minutes!!) plank right now, I’ll get there. I’ll do it. It will be hard, but I’ll do it. 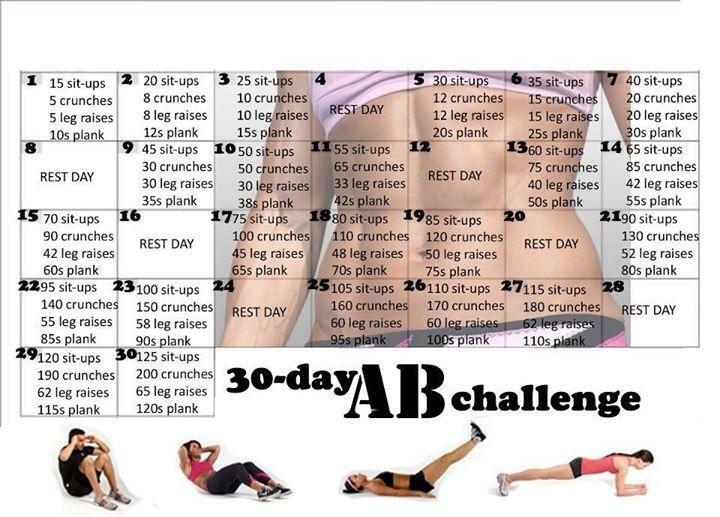 For someone that doesn’t exercise on a regular basis this little challenge has really encouraged me to start. Having a group of ladies that are doing the same challenge (even if we’re not on the same day or maybe take an extra day to complete a set, etc) really helps, too. It’s simple, no DVD or special equipment is needed, and doesn’t take too long or too much mental power–I can even do it at work (and I have)! I’m proud of myself for sticking to it this long, but the ultimate goal isn’t just the full 30 days. It’s continuing after that–and ideally with more exercise variety thrown in. Maybe even another challenge! Have you done a 30-Day challenge before? How did you like it? is an amateur photographer, a soon-to-be wife, a dreamer, a home-owning DIY-er, a dog lover, a cat keeper, a tea drinker, sister, friend, daughter, aunt, thinker, antique-seeker. This little space of the great World Wide Web is devoted to sharing bits of all that she experiences in this wonderful adventure known as LIFE. Explore, enjoy.